Irish American News - Beam Me Up: Chris Hadfield Makes Children of Us Once More - Charley Brady - Opinons; My Own. How very pleasant indeed to wake up yesterday, May 14th, to some good news for a change. Commander Chris Hadfield was returning to Earth after five months in charge of the International Space Station. During that time he has gathered around 850,000 Twitter followers and has, seemingly very casually, made our tentative baby steps into space engrossing for the average person—who possibly was even unaware that we actually HAD a space station at all until the commander began to send those astonishing images of his. Chris Hadfield has made many of us feel like children again. I know that when I sat down to watch him performing David Bowie’s ‘Space Oddity’ on Monday morning I had what must have been a big dopey grin of happiness on my face and—yes, it’s true—just the faintest sheen of tears in my eyes. Just for a few moments my father was alive again, I was eleven years old and the Bowie album of the previous year—1969– was waiting for me under the Christmas tree. And on that previous magical year there had been the most extraordinary event of all. On the street where I lived all of the television sets were on as a man took his first footsteps onto the white disc that we have stared in awe at ever since we oozed our way out of the primordial swamp. I recall to this day one of the neighbours, Mr. Beattie, saying: “Well, we did it.” And that’s exactly how it felt. It was as if every single one of us had a hand in getting there. I suppose it was a long time later before I first heard the term ‘global village’, but on that long-gone day I suppose that even at such a young age I could have explained the rough concept of it. It was one of those moments and instilled one of those feelings that I at least just never quite got over. In fact I have little doubt that it led directly to my life-long love of science-fiction. Three years later, and four years after its initial release, a dream came true when I finally sat down to watch Stanley Kubrick’s “2001: A Space Odyssey”. For the first time I real felt some kind of spirituality. I use that for want of a better word. It’s not quite correct but it’s the best that I can do. It brought this feeling that there was just something out there—not necessarily a God, it didn’t hit me like that at all—but something that was so much bigger than us. And I would hate to work out how often I have seen that film since. And it is new every time. “Look at what you want to be and start sculpting yourself into that person. That seems to me as good a piece of advice as any you could give to a kid. Somehow Hadfield can pull this kind of thing off without looking in the least bit corny; but then if he can pull of wearing a moustache you would have to ask if there is anything the guy can’t do. I don’t think that I’ve seen a hairy face outside of Gerry Adams in years! Do you know something? We have a long and embarrassing history of making a holy show of ourselves in tripping over each other in order to claim everyone from Mohammed Ali to Barack Obama as one of our own. Well, Commander Hadfield may be a Canadian but I wouldn’t groan if he was given some sort of honorary title. If you deserve to be rewarded for making people feel good about themselves again, even for a minute, then this guy deserves it. “It’s too water-intensive. We wear our clothes until dirty and then just throw them away.” Who knew that? I wonder how many of us looked up at the sky last night because of him, with a feeling of reawakened wonder and awe at the vast universe and the beauty that surrounds us. Arthur C. Clarke once wrote that NASA, which was supposed to dominate the seventies, was instead dominated BY them. There are many theories as to why the public lost interest in our work in space, but one thing is for sure: Commander Chris Hadfield has restored that interest. At least, for a while. 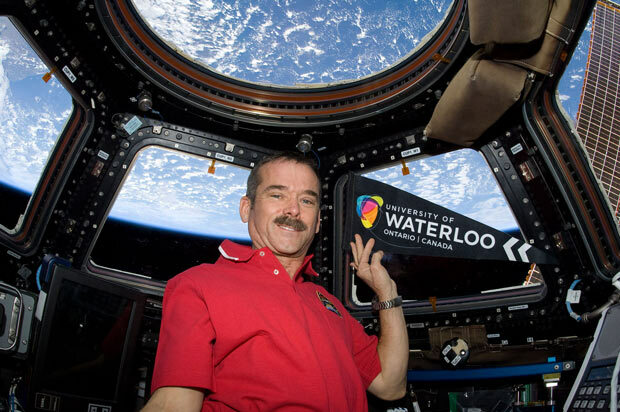 Yes, Hadfield is one cool dude! 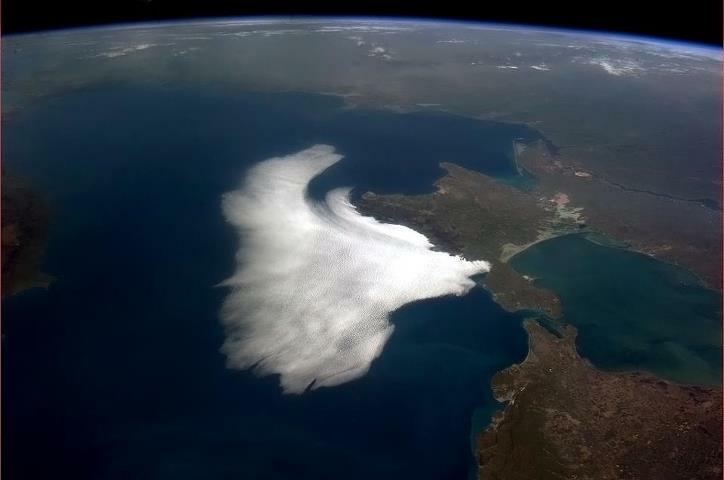 His photos from space are – well, wonderful! I have been a space nut since Sputnik, I sat on my dad’s garage roof for hours just to watch the tiny dot of light go by for a few seconds back in the ’50s so Hadfield, the Space Station, the photos, are just……too cool! I just wish my dad was still around to see this, he would be “over the Moon”. A funny memory, when Sputnik went up I remember being given in school a comic book that told us how the Godless Russians could now put a full size railroad locomotive into space while we could only maybe get a golf ball up, so WE MUST STUDY SCIENCE! No one thought to ask what good a railroad locomotive would do in space. Do you know, Kermit; it was such a pleasure to write something that was unashamedly romantic and positive for a change. And sure, I know that there was a deadly dark side to the Space Race following World War II; but just for a change I wanted to accentuate the good things–and the strange sense of hope and of awe that we felt in 1969…possibly hard to explain to a modern kid. Also, like yourself, it brought back a lot of very happy memories; and thank you for being gracious enough to share yours!